On May 14, 1607 the Virginia Company explorers, 108 of them, landed on Jamestown Island. Their intent was to establish the Virginia English colony on the banks of the James river, 60 miles from the mouth of the Chesapeake Bay. This is the real beginning of the history of what later became the United States of America and is now the sole real superpower in the world. It is also the beginning of the spread of Anglospheric ideas across the world. This brief history tells an interesting tale of the settlement and its subsequent history. Tory Historian was particularly taken with the point that historians and archaeologists have discovered that probably the “gentlemen” and certainly the others worked hard to create the new colony and to make it successful. The early history of English colonization of North America (an attempt to rival and overcome the Spanish, Portuguese and French colonizers, often by warfare) had a mixed history. As it happens, Tory Historian visited the excellent British Museum exhibition, “A New World”. Astonishingly enough, this exhibition has not closed, which indicates some attempts at good timing on the part of Tory Historian, and is strongly to be recommended to anyone who happens to be in London. The core of the exhibition is a selection of watercolours made by John White in what was called Virginia but is now North Carolina during several voyages there in the late sixteenth century. The man was interested in everything he saw: people, their habits, their buildings, the birds, plants and animals around them. His paintings and John Harriot’s descriptions, reprinted subsequently on the Continent, influenced greatly the Old World’s view of the New World, particularly in England. John White’s influence went on as his paintings were copied and engraved for a long time. He was interested in establishing an English colony in Chesapeake Bay, not far from where the Jamestown settlement was built eventually. However, when he took a number of potential settlers, including his daughter and son-in-law, matters did not work out well. The second colony of Roanoke was founded in 1587 with John White as governor. Somewhat mysteriously, he was persuaded to return to England by the other settlers, for more supplies and more people. Having fitted out several ships he found that because of the threat of the Spanish Armada he could not leave the country until 1590. When he finally reached Roanoke he found that the entire colony had disappeared with only the word “Croatan” carved on one of the posts as an indicator as to where the settlers might have gone to. Croatan was an island where, it was assumed, the Indians were still friendly towards the English settlers. The “Lost Colony of Roanoke” has remained a mystery. Sir Walter Raleigh, who had been given the rights to “Virginia” by Queen Elizabeth found himself in disgrace, as well as without the necessary funds. So the attempts to establish an English colony were abandoned until King James and the Virginia Company. On August 21, 1602, in a letter to Sir Robert Cecil, Raleigh expressed his undying faith in the overseas English Empire which he had attempted to establish, saying, ". . . I shall yet live to see it an English Nation." Not quite English, perhaps, but as the Queen expressed it on her recent visit, closely related. It is not often that Tory Historian recommends extreme libertarian publications but this long essay by Murray Rothbard seemed interesting enough to recommend to readers of this blog. With celebrations of the Act of Union and forthcoming celebrations (one hopes) of the Jamestown settlement, the Anglosphere and its various members are being discussed. Naturally, the American Revolutionary War, to some extent another English civil war, is an important part of that history. Rothbard, the well known economist of the Austrian school, libertarian historian and philosopher, here analyzes the work of various modern historians who have looked at the American Revolution. 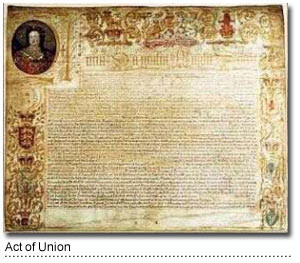 Tory Historian is due to attend a dinner this evening, which will celebrate the Act of Union that came into effect 300 years ago. (Actually, there may be a problem here because of the changes in the calendar but the wording says Ist Day of May, so that is when we celebrate it.) Among the speakers will be the Countess of Mar, whose ancestor, the 23rd Earl of Mar played a prominent part in bringint the union of the two parliaments and the creation of the new one. So the more interesting blog will come tomorrow. But it was not right that a day of such importance in this country's history should pass unnoted on this blog.